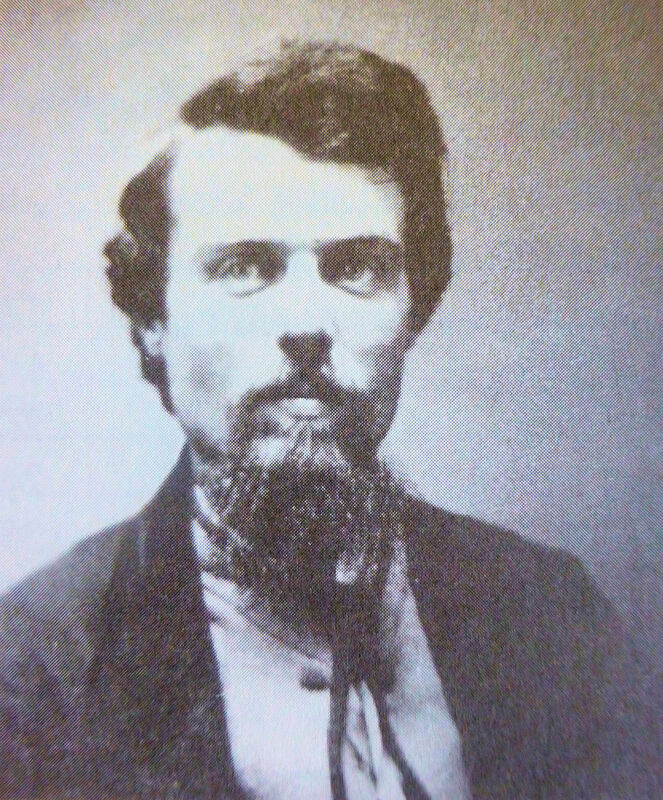 The surname known today as Willett previously had several different spellings, the most common of which was Williat. The Willett name is common in North Buckinghamshire, especially around Great and Little Horwood and the surrounding villages. The Williats, though small in number in Swanbourne, are present in the 17th Century. Joanne Williat from Great Horwood married John Adams, joint Lord of the Manor from 1624 and resided at the Old House. 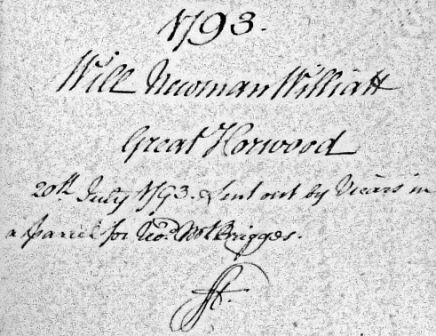 Newman Williat is listed in the Enclosure Act documents as one of the largest landowners in the village in 1762. Arthur Clear in his history of Winslow, written at the end of the 19th Century, considered that the name Newman to have been handed down through the female line from those with the surname Newman of Swanbourne. There is nobody with Newman as surname in the Swanbourne Parish Records (from 1565) and neither are there any here today, but a significant (surname) Newman family seemed to live in Swanbourne in Medieval times. Nineteenth century historians record “A tablet: in the floor of the Church (now lost) to the memory of William Newman dated 1464. Also, In the late 1480`s Thomas Newman and Robert Ryott paid 20 shillings to the Monks of St. Mary de Pre for farm of lands at Swanbourne. In Lipscomb’s Bucks (1847) a plate inscribed “Here lyeth the Bodie of William Newman and his wife Isabel” is also referred to as having the date of 1464 and as now being lost from the Chancil. 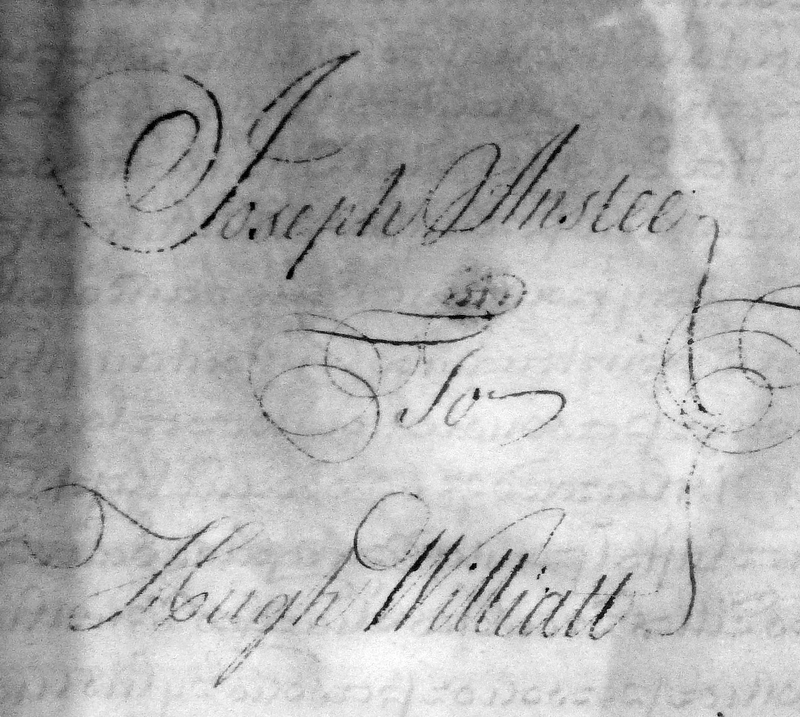 A legal document shows the transfer of lands of Swanbourne resident Joseph Anstee to Hugh Williatt of Great Horwood (likely a relative of Newman) in 1757. The site seems situated off Clack Lane (now Station Road) in the direction of Little Horwood. As Newman Williatt owned Brises Farm and its farmland, and as the Anstees seemed to reside in the Smithfield End part of the village, it seems possible that Hugh Williatt owned the land known on old field maps as ‘Williatt Hill’ on the opposite side of the village off Station Road, which leads to Little Horwood. Alternatively, this could also have belonged to Newman Williat. Brises farmhouse owned by Newman Williat in 1762 (source:- Ken Reading, 1994). At the time of Enclosure in 1762 Newman Williat was awarded a substantial amount of land in Swanbourne. 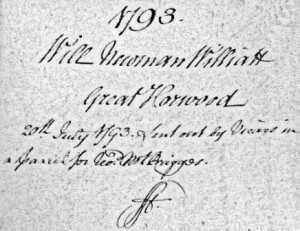 There were two local Newman Williat’s living at this time and through much of the 18th Century, one in Mursley and one in Great Horwood. One of them was the likely owner of Brises farm, which he rented out late in the 18th Century (Reading, 1994). According to family trees on the “Ancestry” Website, derived from several Willett family researchers both at home and abroad, both Newman and Hugh Williat of Swanbourne seem to be direct descendants of the Hugh Williatt (of Great Horwood) and his wife Agnes Adams (sister to Thomas and John who became Lords of the Manor of Swanbourne in 1624) who lived at Adams Farm (now called Athawes Farm) until her marriage. Parish Records show that Agnes and Hugh married at St Swithun’s Church, Swanbourne, thereafter dwelling in Great Horwood. John Adams married Joanne Williatt, (brother of Hugh) in 1610. 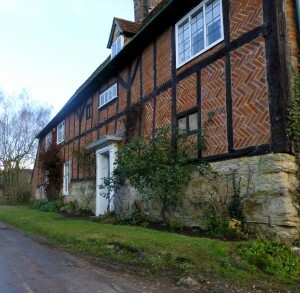 The latter couple came to live in the Old House in 1624, when purchased from the grandson of Sir John Fortescue to become joint Lord of the Manor of Swanbourne with his brother Thomas. A 17th and 18th century Williat/Adams family tree reconstruction shows for the first time the historic significance of this family to Swanbourne:- How the Williats of Great Horwood and Swanbourne share ancestry with the Adams family. The names Newman Williat and Hugh Williat are repeated through several generations as traditional family Christian names. Further research into the subsequent family tree leads us to the Willett (Williat) families who are originally descended from Agnes Adams (who was the sister of John and Thomas Adams – joint Lords of the Manor of Swanbourne in 1624) who are living in the USA today. Within this tree, Alfred Willet (who emigrated as a child with his parents from North Bucks) served right through the American Civil war in the Ohio Infantry. Sources: Buckinghamshire Parish Records, Oxfordshire Parish Records, Bucks Archive, Aylesbury. Book – A Union Soldier Returns to the South by Charles Willett. Publications by Arthur Clear and Ken Reading. Thanks for various research papers on the Willets from Julia Willett Carmichael of Florida. Additional source: Ancestry website.